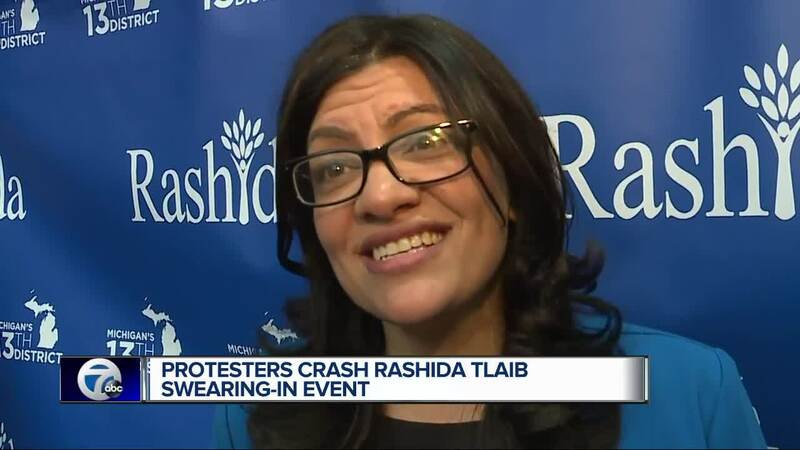 RIVER ROUGE, Mich. (WXYZ) — On Saturday afternoon, Congresswoman Rashida Tlaibs held a swearing in ceremony at River Rouge High School, which drew protesters. Around 15 protesters stood across the street from the high school holding signs and sporting “Make America Great Again” hats. The protest came on the cusp of Congresswoman Tlaib calling President Donald Trump a derogatory term while calling for his impeachment. “I don’t think she’s respectful I think she needs to be recalled and I don’t think she should be in office, she’s an embarrassment,” said Londea Gatt. “Overall we are upset with her rhetoric, I know that some people call us hypocritical for that, but there is a certain respect you should have for the commander and chief,” said Benjamin Hersh. Congresswoman Tlaib spoke to the media after her swearing in about the protest. “These are not my residences of course he’s got people that are here and they come from a far you know my mere existence scares them,” she said, referring to President Donald Trump’s supporters. Congresswoman Tlaib says her first order of business is addressing the government shutdown. “I think it’s really important for people to know that we don’t need the president of the united states to open up government we just need the United States senate to take on leadership, but the American people first, not the president, and actually get us back up and running and have a functional government,” said Congresswoman Tlaib.